Jan. 25, 2018, 10:25 a.m.
By Ricardo Bilton @rbilton Jan. 25, 2018, 10:25 a.m.
NBC Left Field, a 12-person experimental video unit, launched last July with a simple but strategically vital mandate: to experiment with new ways of reporting, producing, and delivering video news, with a special focus on the habits and preferences of younger news consumers. It’s one part digital video unit, one part emerging technology incubator. The unit’s early projects offer a glimpse of what that future might look like. 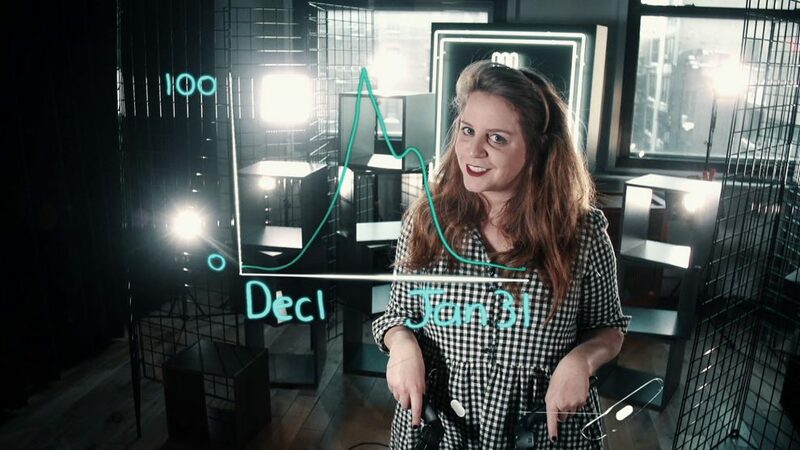 In a recent video about the reality of New Year’s resolutions, Left Field used Tilt Brush, Google’s virtual reality 3D painting technology, to illustrate points in real-time. The video is a follow up to a similar “mixed reality” video that explains the neurological roots of outrage, which was broadcast on Facebook Live. Other videos have recreated the moon landing, tried to recreate the sound of tinnitus, and attempted to spend Jeff Bezos’ fortune. Matt Danzico, head of Left Field, said that the Tilt Brush video was one of the unit’s most exciting projects so far because it offers a vision of how video producers can use virtual reality to unlock new ways of telling familiar stories. The tech is also deceptively simple to use. Because the on-screen elements are rendered in real time, they require no post-processing work, letting creators experiment quickly and easily. The New Year’s resolution video, for example, took just five hours to edit, which is a big deal for a team with a relatively small number of people. Left Field is already thinking about other applications of the Tilt Brush technology, such as applying it to segments of live news broadcasts. But Nick Ascheim, head of digital at NBC News, stressed that Left Field wasn’t developed to experiment for the sake of experimenting. Instead, the unit has a very real mission to help NBC News learn as much as it can about what kinds of video production and delivery resonate with younger news consumers, something that has real, bottom-line implications for the company. Just eight percent of Americans between the ages of 18 and 29 say they often get their news from network television, compared with 49 percent of Americans over 65, according to Pew Research. The picture wasn’t much better for cable, where only 10 percent of young Americans say they often get their news, Pew found. Beyond experimenting with new technology, Left Field has also spent a lot of time honing its take on documentary filmmaking, which is built around, as Ascheim puts it, “helping viewers understand the humans around them.” Left Field’s most popular video on YouTube, where it has 24,000 subscribers, focuses on the Proud Boys, a group of men’s right’s activists in Texas. Other successful videos have covered human rights abuses in the Philippines, what South Korean teens think of North Koreans, and a Swedish museum for failed inventions. The documentaries are short, well produced, and designed for consumption on YouTube and-the-top video platforms. Much of what Left Field has done so far would have been harder to pull off if the unit were housed alongside the rest of NBC’s staffers, Danzico argued. While he admitted he was initially skeptical about operating out of a coworking space, it’s ultimately been a boon to the operation, which benefits from its proximity to other small startups and from being away from the day-to-day bustle of NBC News headquarters. “I can let people go into a room for two straight months and come up with this new and different hardware and a video offering. They would not have had that chance if someone was standing over them and looking at their every move,” he said. At the same time, Left Field is focused on making sure that its ideas trickle up into the larger NBC News operation. To that end, various NBC departments make almost daily visits to the Left Field offices to discuss projects, share best practices, and figure out how they can work with the Left Field team. POSTED Jan. 25, 2018, 10:25 a.m.
Bilton, Ricardo. "With Left Field, NBC News is experimenting with VR, mixed reality, and other new story forms." Nieman Journalism Lab. Nieman Foundation for Journalism at Harvard, 25 Jan. 2018. Web. 25 Apr. 2019. Bilton, Ricardo. "With Left Field, NBC News is experimenting with VR, mixed reality, and other new story forms." Nieman Journalism Lab. Last modified January 25, 2018. Accessed April 25, 2019. https://www.niemanlab.org/2018/01/with-left-field-nbc-news-is-experimenting-with-vr-mixed-reality-and-other-new-story-forms/.